Okay, this post is only tangentially related to Las Vegas, but related it is. My friend Bruce gave me a birthday present while we were in Las Vegas. And a mighty fine present it was. 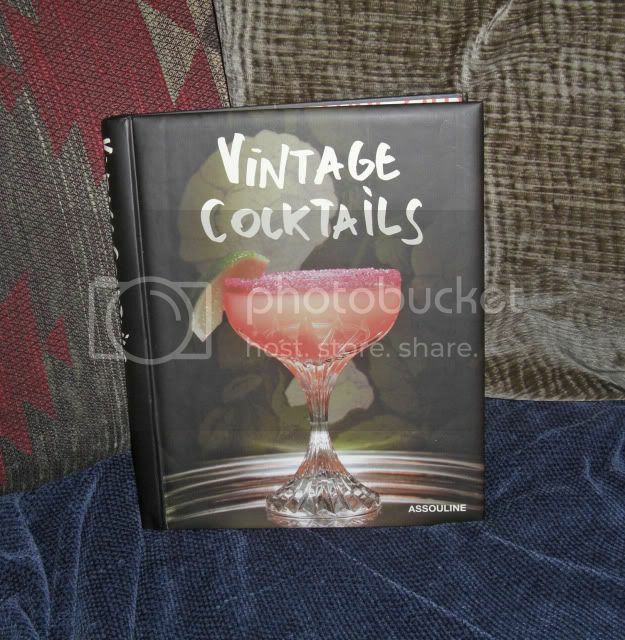 I love classic cocktails and this book is full of them. Several of us who were in Las Vegas are also regulars at the annual Fishing Opener in Minnesota. Our motto - Bring The Opener, Forget The Fishing. 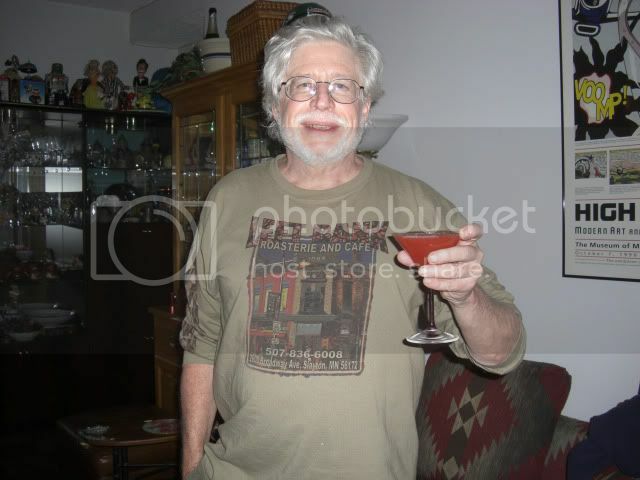 Anyway, everyone thought it would be a brilliant idea if I was responsible for selecting and preparing a Fishing Opener Signature Cocktail each year. 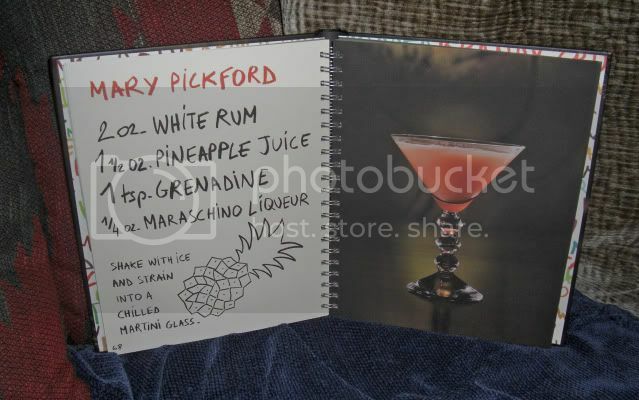 I thought that the first one, appropriate for a bunch of manly men such as ourselves, should be the Mary Pickford. Of course it would be remiss of me to just spring a drink on the boys without testing it first. The Mysterious Chinese Woman and I went to Armando's for dinner last night and on the way home I stopped by the liquor store to pick up most of the ingredients while the Mysterious Chinese Woman dutifully trotted off to pick up the pineapple juice. What a trooper. A trotting trooper. 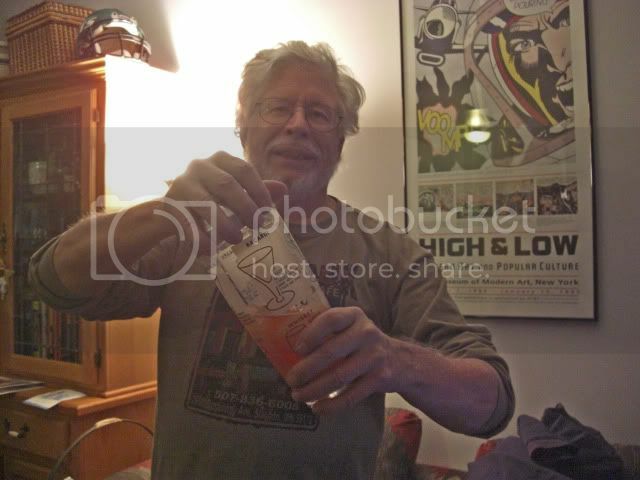 A quick aside, courtesy of Todd at the liquor store - you can substitute the Marischino Liqour for Sweet Vermouth in most drinks. 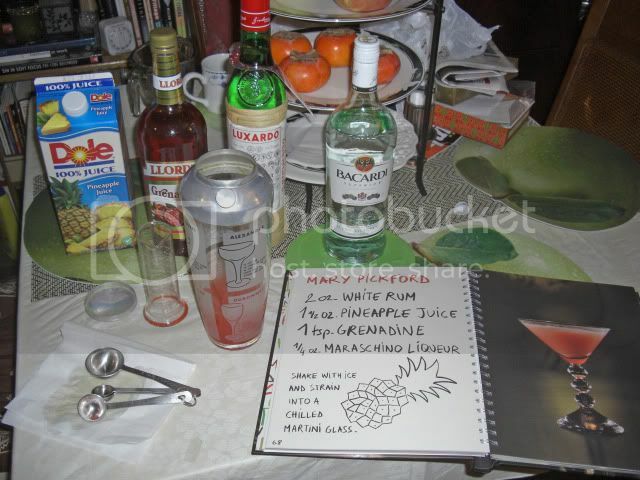 In fact, according to Todd, who is seldom wrong, the use of Marischino Liquor pre-dates the use of Sweet Vermouth. I was concerned about being able to pick up the Grenadine because in New York liquor stores can only sell liquor and wine. No beer, no mix, no olives, nothing. 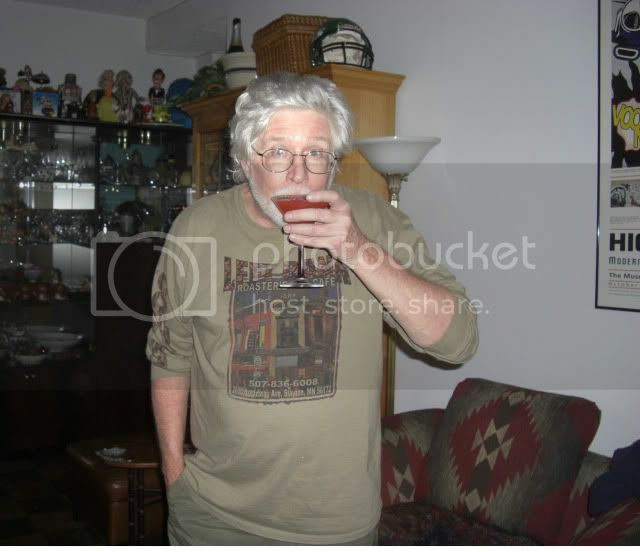 Llord's, however, makes a special version of Grenadine with 1% alcohol and this somehow gets around the law and allows it to be sold in New York liqour stores. Rose's once made a version of their lime juice that way, but I don't think they do anymore. At least I haven't seen it for awhile. And it turns out just like the picture. Of course, the final test has to be the taste. A very good drink indeed. Quite refreshing, a wee bit sweet, but nothing cloying. Just as long as we don't start sticking our pinkie fingers out while we slurp them down. I promise, a few more pictures from Las Vegas tomorrow. I was very lazy yesterday. I love Tiki bars, always have and always will. And I really like dive bars as well. So naturally I really love dive Tiki bars, and Frankie's Tiki Room fills the bill perfectly. If you click on the picture above you can go to the Frankie's Tiki Room website which, as you can imagine, is quite interesting. 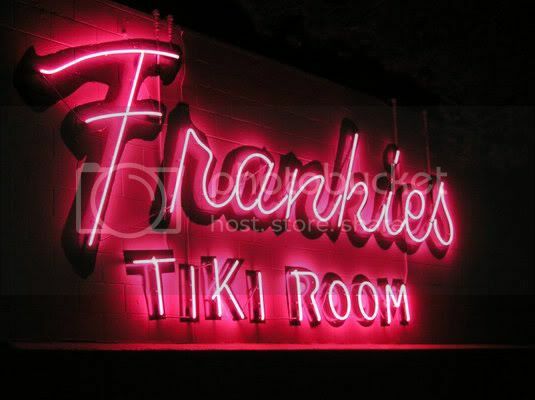 Frankie's Tiki Room is not somewhere your average visitor to Las Vegas is likely to stumble upon. On the other hand, if a tourist did find this place, they most probably were stumbling. It is out where the locals live and play, and it is kind of a non-descript white building with a small parking lot next to a gas station. The reason I talked my buddies into going was that I had seen an ad in Modern Drunkard Magazine, the magazine my brother-in-law bought me (along with a subscription) for my birthday. 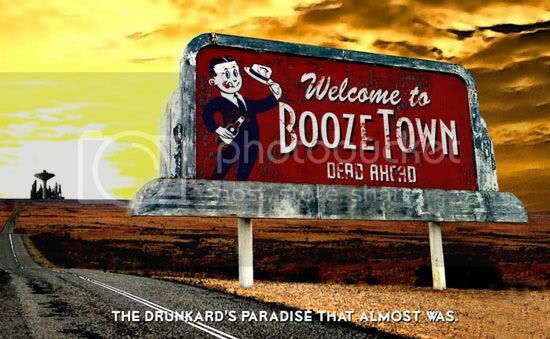 Modern Drunkard Magazine is a mighty fine read. Click on the picture below for a link to their website, you won't be disappointed. But I digress. As any good dive bar should be, this place was amazingly dark. When you first walked in you were, for all purposes, blind. There were a couple of small televisions playing cuts from some of the strangest movies I have never seen. They looked like they ranged from the 1930's to the 1960's and the common theme was, well, that is a very good question. Things vaguely Tiki, I guess. But what they considered vaguely Tiki seemed to range from Zombie movies, very appropriate, to Hawaiian dancers, also appropriate, to what looked like an early version of Charlie's Angels. A very early version. Scene's from I Married A Genie would have fit in, somehow. Right next to the scenes from I Married A Zombie. 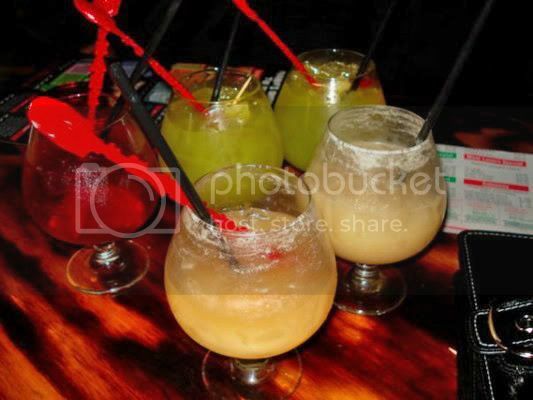 The drinks ranged from the standard dive bar beer and a shot to the standard Tiki fare such as Mai Tai's, Navy Grog's, and Zombies, to their more eclectic Tiki creations such as the Green Gasser and the Bearded Clam. I stuck with the Zombies, which were very good indeed. The bartender said it was someone's original 1956 recipe, and I have no reason not to believe her. They were quite tasty and very rummy. My buddies all stuck to the standard dive-bar drinks, mostly Rum and Cokes. No sense of adventure. I was also the only one to buy the must-have Frankie's Tiki Room calendar. Frankie's Tiki Room was a great little find and I want to thank Modern Drunkard Magazine for bringing it to my attention. If you ever get to Las Vegas I would strongly recommend that you make the extra effort necessary to visit this place. After we left Frankie's we headed to the Double Down Saloon. Both Frankie's Tiki Room and the Double Down Saloon are owned by the same person, group, or whatever. There is also a Double Down Saloon in the East Village in Manhattan and it too is part of the same group. I will certainly make a point of getting there. I will cover The Double Down Saloon and the rest of my trip, if it all fits, tomorrow. Time to watch some football and then meet The Mysterious Chinese Woman and a couple of her Mysterious Sisters for dinner sometime between the end of the Jets game and the start of the Giants game.